Consumers continue to get better at tuning out traditional outbound, interruptive marketing. Think about it — we use our DVR to skip commercials, we don’t answer telemarketer’s cold calls, and our SPAM filters catch unwanted e-mails before we ever see them. So how do you win new clients when it seems so hard to reach them? Instead of blasting people with interruptive, outbound methods they’re likely to ignore, inbound marketing brings clients to you. By using social media marketing, blogging, and other inbound methods, you provide remarkable content potential clients are seeking, and position yourself as the go-to expert. When a potential client is ready to buy or sell, you’re the one they seek out. Inbound is marketing made smarter. Traditional outbound marketing is like a megaphone. You're broadcasting a mass message, hoping someone, anyone listens. 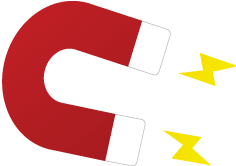 Inbound marketing is like a magnet, drawing interested potential clients to you. Inbound marketing works by giving people what they want. Rather than bombarding people with information and hoping it sticks, inbound brings the right customers to you. Creating and sharing content that reflects your potential customer’s needs means you’ll naturally attract interest and traffic. The goal is to “get found" through high search rankings. If your content shows up at the top of Google searches, it will drive more traffic and leads to you. Inbound marketing doesn’t completely replace outbound marketing, but it should be your focus. By using our platform to manage your blog, social media, website, and lead nurturing, you’re a step ahead of your competition. You have everything in one simple, convenient system. Plus, we help you along the way with tips and training. Instead of just telling you what you should do, we actually help you do it.